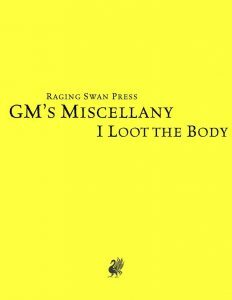 This compilation of the „I Loot the Body!”-series (easily one of my favorite series-titles ever) clocks in at 56 pages, 1 page front cover, 2 pages of advertisement, 1 page editorial, 1 page ToC/how to use, 1 page SRD, 1 page back cover, leaving us with 49 pages of content, so let’s take a look! Note: This is almost identical to the “PFRPG”-version with the black cover – which is almost system neutral. However, this system-neutral version did obviously get some polish – a couple of entries have been streamlined, references to specific languages have been made more general – you get the idea. We begin this compilation with a helpful reminder/summary of how one can use treasure – foreshadowing, abilities, etc. – this is a handy reminder to bear in mind, for sure – but more importantly, it contextualizes the material presented within this book: We *all* have read supplement upon supplement, where those critters that the PCs mow down by the dozens all end up having a bit of gold…and then suddenly, something weird pops up. It’s like having a hotspot in a point and click adventure. While authors are beholden to the almighty word-count and thus, system-immanently reliant on such simplifications, I know of a lot of GMs who really, really are annoyed by this. This humble series, this booklet, radically ENDS this phenomenon once and for all. You loot something? You’ll find weird and personal knick-knacks basically EVERYWHERE. This not only makes the cursed trinket you successfully smuggled into the possession of the party harder to spot, it also vastly enhances the believability of the campaign world you so lavishly depict in your game – in short, it represents a huge immersion boost, even if the items are not (or only slightly) magical. More than that, fetishes, strange objects, keys, mementos and artworks can represent hooks and pieces of indirect storytelling themselves, potentially sparing you the annoying exposition dumps some GMs find themselves heaping upon their players; in short, the trinkets let the PCs do the thinking, talking, discussing -and if you listen, you may well draw some serious inspiration from the speculation going on – I know that’s how I’ve improvised more than one module when I didn’t have the time to prepare. Anyways, as you may have surmised at this point, this book contains the individual components of the “I loot the Body!”-series: Namely, the eponymous original pdf, the installments on looting clerics, druids, rogues, minions, warriors and wizards as well as the installment on looting bags of holding – basically all the big installments, presented in alphabetical order. Now I have written reviews for all of them, so if you require detailed guidance, I’ll point you to those. In case you do not want to look them up: The review situates all of these files in the high and highest echelons of my rating system – Raging Swan press provides a nice diversity between the mundane and weird in these extensive tables. We generally have tables for outfits, class-specific knick-knacks and pouch-contents –all modified for the respective needs. Minions get a keepsake table, druids natural accoutrements – you get the idea. Editing and formatting are top-notch, I did not notice any undue accumulation of hiccups and the obvious added care in fine-tuning the tables deserves special recognition. Layout adheres to raging Swan Press’ two-column b/w-standard and the pdf sports a wide-variety of thematically-fitting b/w-artwork, though fans of Raging Swan Press will be familiar with some pieces. The pdf version does come in two iterations: One optimized for screen-use and one optimized for the printer – big kudos! Beyond that, the pdfs do come with excessive bookmarks, helping you to navigate to the proper table with a single click. Kat Evans, Taylor Hubler, Eric Hindley, Josh Vogt and Mike Welham have created great individual files, no doubt; but much like in the fantastic GM’s Miscellany Dungeon Dressing and Wilderness Dressing books, having all the pieces in one hand tome simply beats the sheets of individual paper. Flip it open, roll, and never look back; never experience boring “mundane” treasure again! Now, it should be noted that these tables are not for specific creatures or contexts – they provide loot for pretty wide categories, so if you’re looking for the hyper-specific, well, you won’t find that here. If you do look for an inspiring book that will increase your GM-prowess, though, then get this! In fact, I’d advise in favor of the print version, just for the convenience of it and the sheer satisfaction of having this booklet open while gaming. Now, as for the question of which of the two-versions to get, well the system-neutral version imho has a couple of wording choices that are a bit more elegant than the PFRPG-version, mainly due to completely avoiding the rules-aspect, so for prose, this may be preferable. For convenience, the black version should do it (and it has the prettier cover) – but no matter what fantasy system you’re using, one of the books definitely makes for a great addition to the game and both versions can work for pretty much all systems. In short: This is a really great, system neutral tome of cool dressing, well worth getting. My final verdict thus clocks in at 5 stars + seal of approval, given sans hesitation. The only reason I’m not also slapping my EZG Essential-tag on this great dressing booklet would be its brevity – if it featured a smattering of all the small tables for more specific looting as well, this’d be even more non-optional than it already is. A great GM-tool indeed. You can get this great compilation here on OBS!